The Crist Instrument Isolation Chambers are designed to meet or exceed the needs and specifications of today’s modern researcher. They facilitate the collection of a wide variety of protocols, which include but are not limited to, audio, physiological, and optical stimuli. They allow an investigator to work with more subjects in a smaller space, or just keep a subject from being distracted by other stimuli in the surrounding area. We can either customize any one of our standard chambers or design a unique chamber just for you. 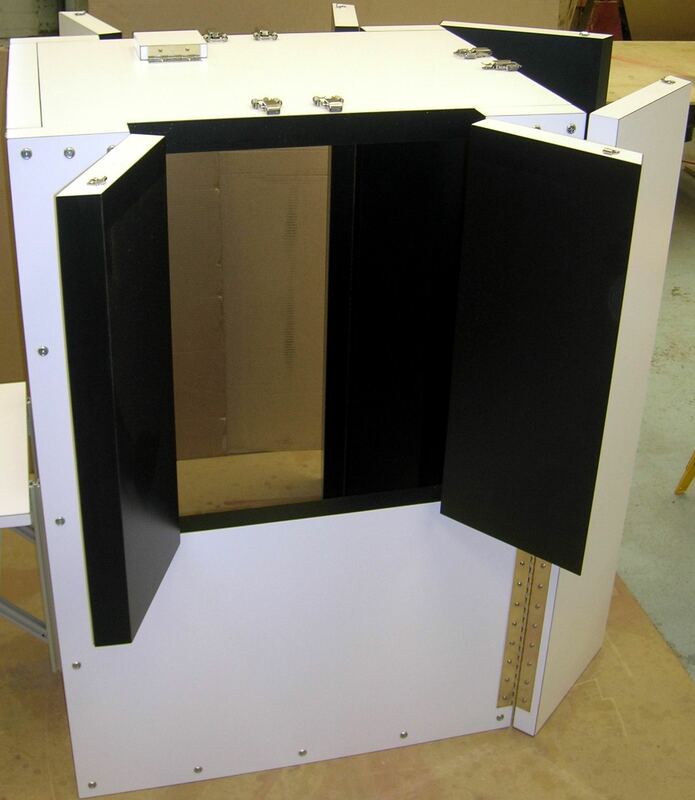 Every Isolation Chamber we make is made with the best quality workmanship and materials to hold up for many years. • Standard Chamber inside dimensions is 29.2” (74.2cm) wide x 38.5” (97.8cm) deep x 53” (134.7cm) tall. • All panels are fully wrapped in laminate for a water tight seal on all surfaces. 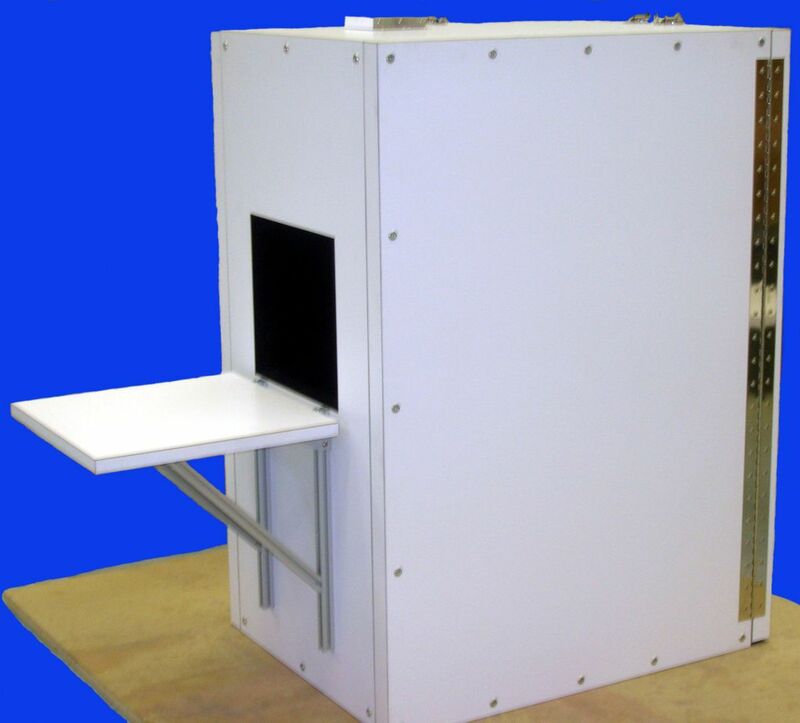 • Features include compatibility with our Primate Chairs in all aspects of loading and port access for subject testing. • Comes in a variety of color combinations (the standard is a black interior with a white exterior). • Fully connected copper exterior on all 6 sides, this option provides a Faraday RF type shielding. • One inch thick sound dampening material inside the 2” thick walls to avert outside distractions. • Adjustable shelf on front of the chamber for a computer monitor or any other set up needed for your protocol. • A large 15” (38.12cm) x 13.5” (34.3cm) port above the shelf. • Lidded top 4” x 4” access port for inserting cameras, wires or other equipment needed. • A locking slide with positioners and Chair Locks for Primate Chair stability on the inside. • Stops at the anterior and posterior of the slide to make for easy loading and precise positioning every time. • Double doors in the rear that open the full width of the chamber so they are never in the way for insertion of the Primate Chair (please visit our Primate Chair section for more information). 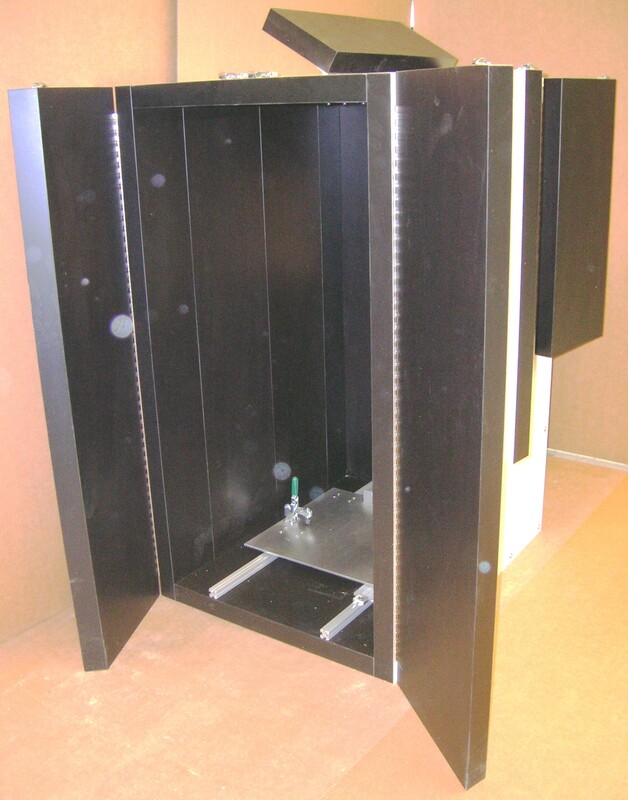 All standard isolation chambers come with the above features as well as the specific features described below.All standard isolation chambers come with the above features. 8-WBO-1A SERIES: FULL LENGTH DOORS ON ONE SIDE. 8-WBO-1AM SERIES: FULL LENGTH DOORS ON ONE SIDE, HALF LENGTH DOORS ON THE OPPOSITE SIDE. Full length doors on one side. 8-WBO-1AL – Basic Isolation Chamber, double opening doors on rear and double opening doors on left side. 8-WBO-1AR-ELE – Basic Isolation Chamber, double opening doors on rear and double opening doors on right side with contiguous copper laminate shielding on outer surfaces. Basic Isolation Chamber, with full length doors on both sides. Black laminated interior, white laminate on the exterior. 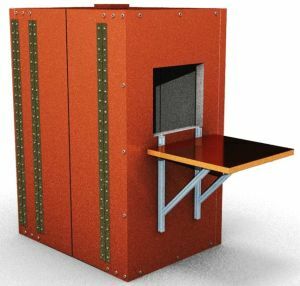 8-WBO-1AF-ELE – Basic Isolation Chamber, with full length doors on both sides and contiguous copper laminate shielding on outside surfaces. Full length doors on one side, half-length doors on the opposite side. 8-WBO-1AML – Basic Isolation Chamber, with double opening doors on rear, double-opening full length doors on left side, and half-length double doors on right side. 8-WBO-1AMR – Basic Isolation Chamber, with double-opening doors on rear, double-opening full length doors on right side, and half-length double doors on left side. 8-WBO-1AML-ELE – Basic Isolation Chamber, with double-opening doors on rear, double-opening full length doors on left side, half-length double doors on right side, and contiguous copper laminate shielding on outer surfaces. 8-WBO-1AMR-ELE – Basic Isolation Chamber, with double-opening doors on rear, double-opening full length doors on right side, half-length double doors on left side and contiguous copper laminate shielding on outer surfaces. • Choice of laminate or Contiguous copper laminate shielding. These are just a few of the customizations that Crist Instrument has incorporated into their Isolation Chambers over the years.